In a news clipping from Business India Magazine, an article entitled “Clicks and Cash” features a quotation from the CGS Infotech president at a time when our company was one of only two in India authorized to sell Google Adwords. It shows how CGS Infotech has always been an industry leader. That’s how the company is able to provide great results to businesses of all kinds that want better search engine ranking through expert SEO services. 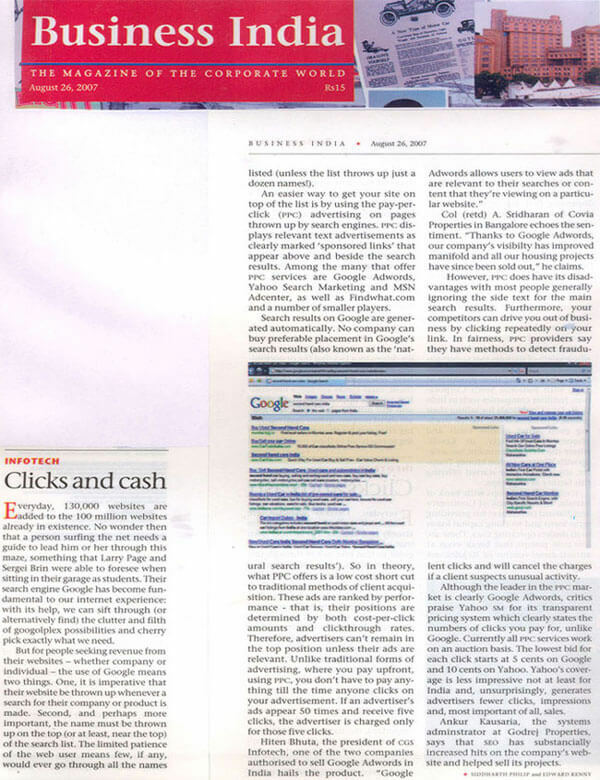 In a news clipping from Business India: The Magazine of the Corporate World dated August 26, 2007 and titled “Clicks and Cash”, a quote from CGS Infotech president Hiten Bhuta is featured. At the time, CGS Infotech was one of only two companies in India allowed to sell Google Adwords. Bhuta expresses his support for the product since it allows advertisers to reach customers where they are. Even in 2007, CGS Infotech was already a leader in search engine marketing, Internet marketing and online advertising, as this early clip demonstrates. The company was positioned at that time as a quotable industry leader and still is. Great results are available for your company when you rely on our industry-leading experience and expertise. To get started with us, simply contact us for your free 15-minute telephone training session about Internet marketing. We’ll explain the importance of search engine optimization, Facebook marketing and more — and answer any questions you have about how CGS Infotech can help your company rank better in search engines, get more customers andincrease your sales. All you have to do now is contact us for the free 15-minute training session by phone. We’ll take care of the rest for you. We look forward to welcoming you and helping you become one of our satisfied clients.